1. Preheat the oven to 200˚C, gas mark 6. On a parchment-lined baking tray, toss 1 tbsp muscovado sugar with the cherries. Spread out and roast for 18-20 minutes, until sticky and caramelised, then set aside to cool completely. 2. In a large jug, whisk the cream, egg yolks and a pinch of salt with the remaining 3 tbsp sugar, until combined. 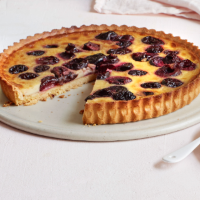 Put the pastry case onto a rimmed baking tray, pour in most of the custard and scatter over the roast cherries. Put in the oven, then carefully pour in the remaining custard. Bake for 15-20 minutes, until lightly browned and just set, with a slight wobble in the centre. Cool on a wire rack and serve warm or chilled.